Status: Federal protection reinstated via court order December 2014. More information. Status: Federal protection reinstated via court order in December 2014. More information. September 2018 - National Park Service begins its wolf relocation project - a planned "genetic rescue" of Isle Royale’s dwindling wolf population to keep the species going and allow the unique ecological study that began 60 years ago to continue. 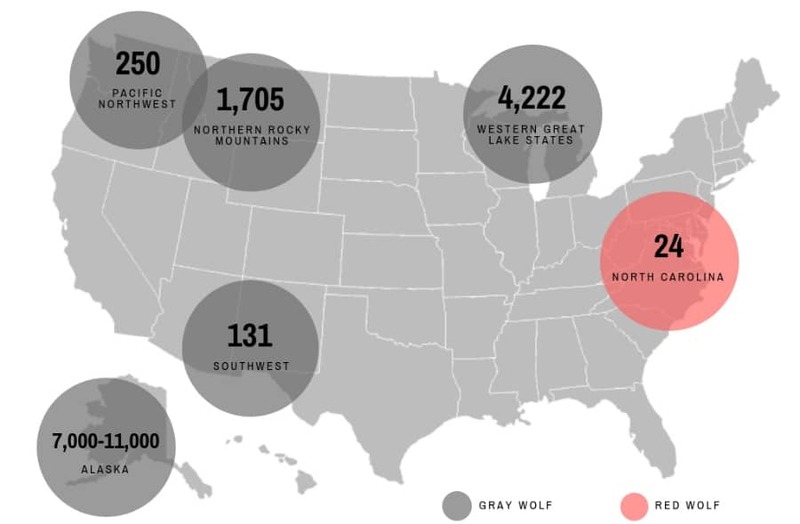 As of April 2019, 13 wolves had been relocated to Isle Royale from the mainland of US and Canada. Status: Population state managed. Idaho’s wolf management plan includes an annual harvest season. More information. Status: Population state managed. Montana's wolf management plan includes an annual harvest season. More information. » Wyoming: 286 (Apr. 2019), a population drop of 61 compared to 2018. Status: Population state managed. (Federal appeals court upheld the U.S. Fish and Wildlife Service’s 2012 decision to remove gray wolves in Wyoming from the endangered species list -March 2017) More information. Status: federally protected. More information. 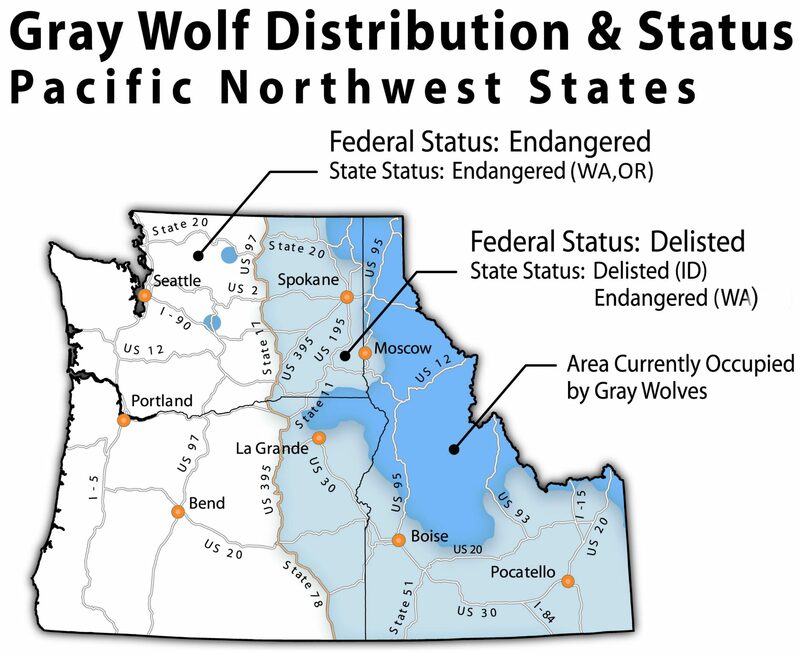 Status: Wolves throughout Oregon were delisted from the state Endangered Species Act (ESA) on November 9, 2015. Wolves remain federally protected in the western portion of the state (west of Hwys 395-78-95). More information. » Washington: 126 (March 2019) individual wolves, up from 122 from the previous year. Status: State/tribe managed in the eastern third of the state. Federally protected in the western portion. More information. Status: Federally protected with exceptions as a nonessential experimental population. Status: Federally protected with exceptions as a nonessential experimental population. Fact Sheet re 2015 Final Rule courtesy USFWS. » U.S. Fish and Wildlife’s Mexican Wolf Recovery Reports. Status: Population state managed as both a big game animal and a furbearer, management includes intensive predator control programs. More information. Status: federally protected with exceptions as a nonessential experimental population.More information. » Learn about the ongoing Review and Evaluation of the Red Wolf Recovery Program.